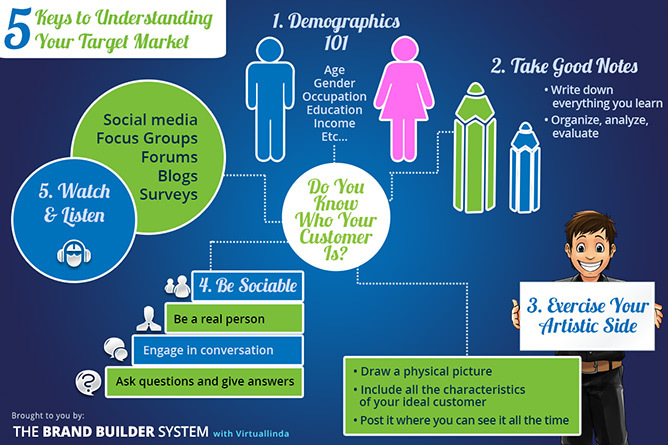 We have recently discussed the different ways you can build your audience, as well as how to use all kinds of different marketing analytics to your advantage. We have also reviewed the importance of building business goals and configuring marketing tactics with these goals in mind. 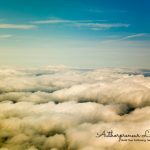 The first thought that is probably running through any newly baptized authorpreneur’s head is that rapidly building a high volume of traffic should be a main business goal for anyone. However, apart from some very specific cases, building a high volume of traffic will not happen overnight, and if you are just tracking numbers and comparing to other websites you may be sorely disappointed. If your target audience has a lot of “share-potential,” large followings on social networks, for example, you may see your traffic numbers begin to rise rapidly. On the other hand, if they don’t, and your niche audience doesn’t really include bloggers or online entrepreneurs, you may not see a huge growth in a short space of time. So, while it is important to track traffic numbers in general, your business goals should focus on building a targeted loyal audience, driving them to your website, and turning their visits into sales. Always remember that targeting the right audience is going to help your growth in the long run. Metrics and statistics will help you analyze all types of areas where you can refine your target audience, and better your marketing techniques. However, metrics don’t mean much when you can’t use them, so it’s very important to identify the metrics that matter to your business. First of all the metrics that you use need to be easy for you to understand and use to your advantage, and they must also work together to help build a picture of what they are saying to you. Secondly, they should be easy to replicate across the board, as this will ensure consistency in readings every time you need them. 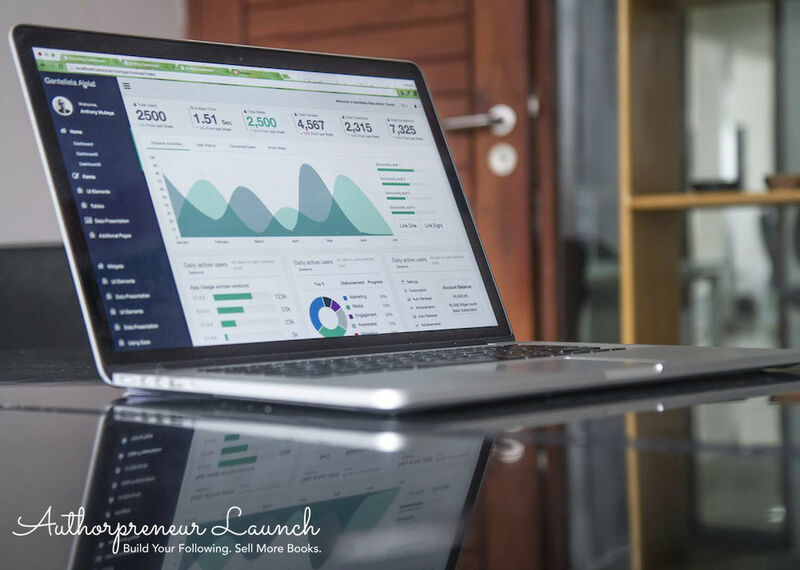 Lastly, your metrics should provide you with useful information that you can then use to create action items for your business growth. For example, metrics that provide customer background are going to help you determine your target audience, and where your business is coming from. 4. Bounce Rate. The bounce rate shows you what percentage of visitors leave your website before further exploring your website. For example, if a potential visitor finds your homepage after searching for you and leaves the page before clicking any other links, they will be considered to have “bounced.” Generally, you want the bounce rate to be as low as possible because the more time someone spends on your site, the more likely they are to convert and perform a meaningful action. 5. Total Conversions. Total conversions is one of the most important metrics for measuring the profitability of your overall marketing efforts. While it’s possible to define a conversion in many ways (such as filling out a subscription form, completing a checkout if you sell your book directly on your website, etc. ), conversions are always seen as a quantifiable victory in the eyes of a marketer. You can measure conversions on your site directly, depending on how it’s built, or you can set up a goal in Google Analytics to track your progress. Low conversion numbers could be the result of bad design, poor offerings, or otherwise disinterested visitors. 8. Customer Value. Customer value is a difficult metric to calculate. It isn’t going to tell you the health of your sales or marketing efforts, but it is going to be helpful in determining your overall return on investment. It can also be useful in setting your annual company goals. To find your average customer value, you have to take into account all sales the average customer will initiate over the course of your relationship. 9. Cost Per Lead/Subscriber. Your cost per lead is dependent on the type of strategy you used for each lead generation channel, so it’s a much more specific metric than some of the “big picture” figures we discussed earlier. To calculate your cost per lead, take a look at the average monthly cost of your chosen campaign and compare it to the total number of leads you generated with that specific channel over the same period. For example, if you spent $500 in advertising for a pay-per-click campaign and achieved 10 total conversions over the same period, your cost per lead would be $50. Be sure to incorporate “invisible” costs, such as management time, startup costs, and peripheral expenses. Regularly checking these metrics will provide you with an accurate pulse of the health of your digital marketing campaigns. Over time, you’ll be able to refine your tactics, closely examine which strategies work best and why, and end up with a steady marketing rhythm that can generate more than enough leads to cover your marketing costs and deliver a significant profit. Marketing analytics and metrics go a lot deeper than just numbers. Every single number that you see on your reporting dashboard will provide you with information on the source of traffic to your website, and these sources will help you determine where your traffic is coming from and why. Take keyword analytics for example: the keywords the drive people to your website will help you see where you are making bank and where you are going wrong. 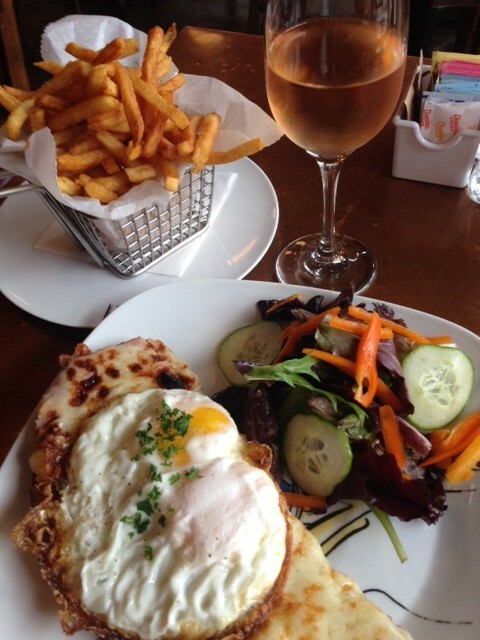 Finding the right keywords to add in your blog posts is key to great search engine optimization (SEO). The best way to find accurate keywords that work for your website or blog is to use Google Search Console. To reap the benefits of Google Search Console, you will have had to add your website and sitemap so search console can crawl your website and give you accurate feedback on how people are finding your site. If you need help setting up Google Search Console, Google has a guide HERE. After you’ve added your sitemap, you will need to wait about a week for data to populate. 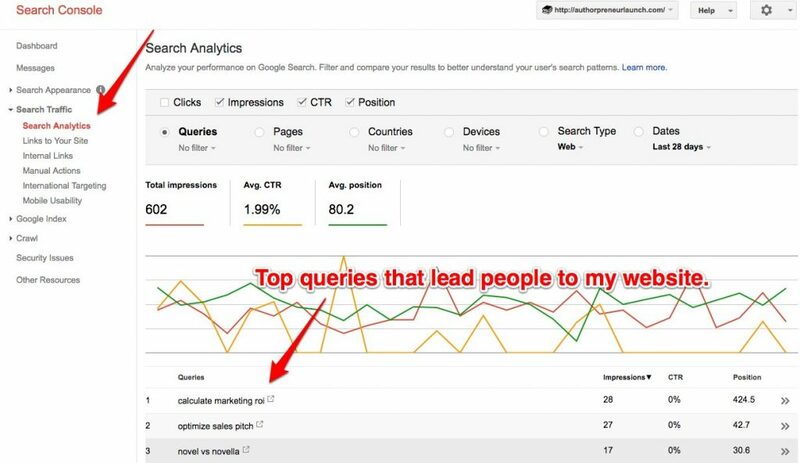 After that, click on your website name, and under Search Traffic, click Search Analytics. Make sure the checkboxes at the top for Clicks, Impressions, CTR, and Position have been selected. Clicking around in this portion of Google Search Console has helped me redefine the direction for my website and helped me choose which keyword phrases to use when writing my blog post headlines. SEO is an art form in itself, and properly placed keywords can really help drive traffic. But, again, you want to make sure that you are driving the right kind of traffic to your website too. It’s interesting to look into which keyword searches, organic or paid, turn into sales, and from there you can work on fine-tuning your SEO technique. If a report states no keywords were used to drive traffic, this is also valuable information as it just means that your visitors are coming from other sources, which you can then use to your advantage. A Referrers report can determine whether visitors came to your website directly, via a shared article, through an email or any other sources that are out there. This is a great way to see if your marketing campaigns are working well or if they should be tweaked. Once you understand how to read and use your metrics, you can use statistics to measure your performance by creating Key Performance Indicators (KPIs). KPIs will become the measure of how well you are progressing towards your business goals, and they are the standard that you set to meet every week or month in order to meet your goals. For an author your KPIs can be all types of analytics that matter: social media and website click-throughs, email subscription and unsubscribe rates, search engine rankings, social media shares and so on. Once you have created your KPIs you can create your KPI dashboard which will combine statistics with criteria for meeting your business goals, and therefore a good overview of whether you are staying on track or not. There are several paid KPI dashboard services, or you can create your own in Excel by watching this tutorial HERE. When used correctly, analytics are a treasure trove of useful information for any author and can be used to not only determine your target audience but also to develop effective and successful marketing campaigns that will ultimately help you meet and beat your business goals. 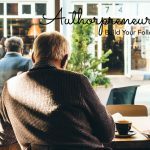 As you have questions about metrics and tracking, hop on over to the AuthorpreneurLaunch Forum to ask questions. I’ll get back to you asap. Use information you already know about your users to pre-fill lead generation forms in order to make it easier for them to convert. Click HERE to tweet this tip. 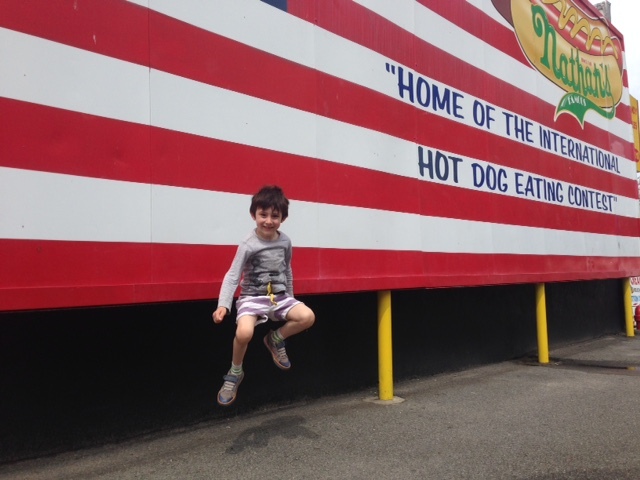 Photo of the Week: We visited Coney Island, Brooklyn and ate hot dogs and fries at Nathan’s Famous Coney Island. 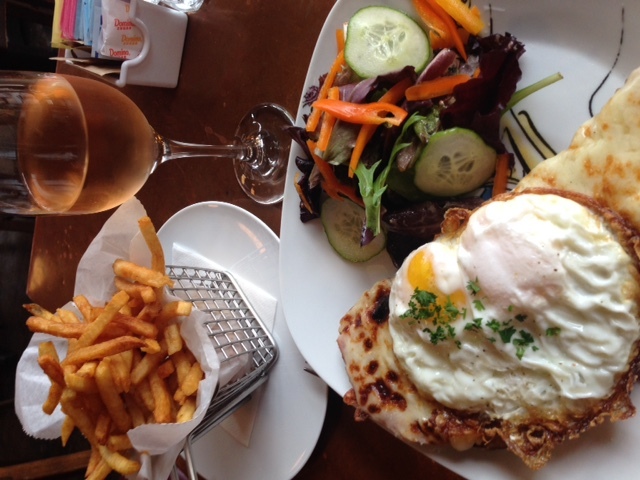 Meal of the Week: We launched a new discussion board and book club at Riffle Books and had a celebratory lunch of croque madame, salad, fries and rosé (Because of the light pink color, the rosé seemed fittingly Spring-y 🌷🌼🐣🍷) at Provence en Boite in Carroll Gardens, Brooklyn.